The back-beat commonly refers to a snare drum playing on beats 2 and 4 in a 4/4 beat – i.e. on the off beat. The big drum on the floor played using a Bass Drum Pedal. For more info see ‘Parts of a Drum Kit‘. The foot operated pedal used to play the Bass Drum! For more info see ‘Parts of a Drum Kit‘. The batter head is the head you hit. Batter heads are designed to be hit, resonant heads are not (see Resonant Head). There are many different types of batter heads – from plain old clear plastic through to coated heads, double ply (layer) heads and even oil filled heads! The bearing edge of a drum shell is the edge on which the drum head sits. A Buzz Roll is commonly played on the Snare Drum (but can technically be played on any drum). It’s a drum roll that involved multiple bounces from each stick to create a ‘buzz’ noise. Unlike a Double Stroke or Open Roll, the Buzz Roll doesn’t have a set number of bounces per stick. Instead the drummer is looking to create a tight buzz sound appropriate to the music being played. Although the number of bounces in a buzz roll is somewhat random, the movement of the hands is not. Cable hats allow the hi-hat cymbals to be positioned away from the foot pedal – they’re then operated as usual and the movement of the pedal is transmitted to the hi-hats via a cable. The hi-hat clutch holds the top cymbal and attaches it to the pull rod of the hi-hat stand. A drop clutch has a mechanism built into it to hold or lock the top cymbal in a ‘down’ position, forcing the top and bottom cymbals together as if you had your foot on the pedal. This is handy if you play a double bass drum set-up and your left foot is otherwise occupied. As the name suggests, Crash Cymbals make a crashing noise! It’s common to have at least one crash cymbal, often two and many drummers will have lots of crash cymbals around the kit. Additional crash cymbals not only give variation to the sound and colour of the playing but also have a practical application in being closer to particular drums, meaning you don’t have to reach as far when coming out of a fill and need to hit a crash cymbal. For more info see ‘Parts of a Drum Kit‘. The down-beat commonly refers to beat 1 of the bar. The up-beat commonly refers to the last beat of the previous bar (beat 4 in 4/4). A drum fill is a short break from the main beat to play something a bit more interesting – normally a fill comes at the end of a musical phrase to bring you into the next part of the tune. They can be very simple or highly complex. The hi hat cymbals are relatively small cymbals that clamp together using a foot operated pedal (via a hi hat stand, X-hats etc.). Hi hat cymbals are typically 14″ in diameter but are available in other sizes. The bottom cymbal stays stationary – the top cymbal attaches to the push rod of the hi hat stand via a Clutch, so operating the hi hat pedal makes the top cymbal go up and down. In the ‘down’ position it touches the bottom cymbal and this is how it’s most commonly played. For more info see ‘Parts of a Drum Kit‘. The hoop of a drum holds the head onto the shell of of the drum, pressing the head against the bearing edge. Inserts are the rattly bits inside lugs that your tension bolts screw in to. Some drums have foam or rubber padding around the inserts to help stop them from rattling if, for example, you’ve taken off the resonant heads from your toms. Tension bolts screw into Inserts inside lugs on a drum. The lugs are generally screwed to the shell of the drum from the inside. A memory lock is a secondary bolt or bracket on a drum designed to ‘memorise’ the position you prefer the drum to be held in. A common application is on cymbal stands and the memory locks can be used to lock the angle and / or height of the stand. Ply simply means layer. Most drum heads are single ply – i.e. a single layer of plastic (Mylar polyester film). A double ply head consists of 2 layers of plastic. Plies also applies (pardon the pun!) to drum shells as the wood is generally in layers – a 3 ply shell means it’s made of 3 layers of wood glued together. Most drums have 2 heads – the head you hit (the batter head) and the head you don’t hit (the resonant head). Never hit the resonant head – it’s not designed to be hit and is likely to break or dent. Your resonant head should always look immaculate – if it’s dented or damaged you should replace it or even remove it completely. Some drummers prefer to remove the resonant head for a drier sound but be aware that when hoops aren’t attached the lugs will rattle. Ride Cymbals are generally the largest cymbal in a drum kit and you normally only have one of them. These are used to make a ‘ping’ sound commonly as an alternative to playing the Hi Hat. For more info see ‘Parts of a Drum Kit‘. This is more common with higher end drum kits. A shell pack is ONLY the drums with no other hardware, stands, cymbals etc. So a common shell pack for a 5 piece drum kit would actually only consist of 4 drums – the bass drum and 3 toms. Yes, snare drums aren’t always included with shell packs! Double check this before buying your drum kit. 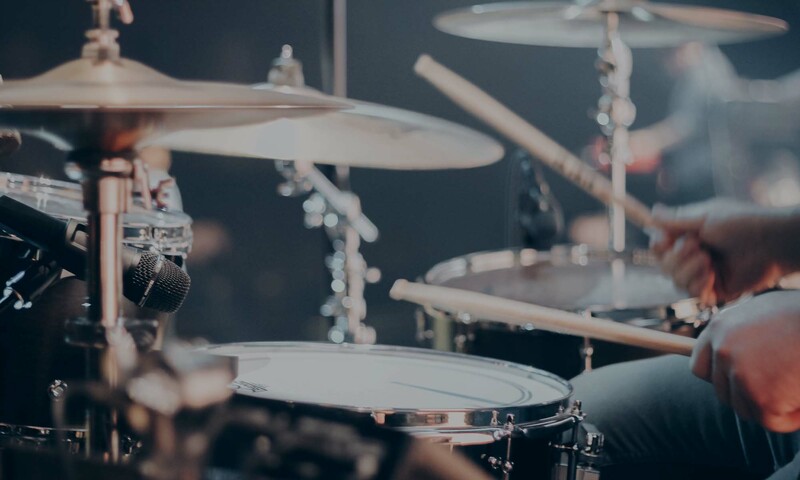 The snare drum is the main drum that you hit on your kit – it sits between your legs and generally forms the Backbeat in most popular drum beats. They’re normally 14″ in diameter and around 5-6″ deep but are also available in a wide range of other sizes. They have snare wires on the bottom, covering the resonant head, giving that distinctive snare sound. The snare wires can be ‘switched off’ using the Snare Strainer or Throw-off. For more info see ‘Parts of a Drum Kit‘. This is the mechanism on a snare drum designed to allow you to switch the snares on and off. In the ‘on’ position the snare wires are raised to touch the Resonant Head. In the ‘off’ position the snare wires are lowered so they don’t touch the Resonant Head. Tension bolts hold the hoop of the drum and therefore the drum head onto the shell of the drum. Tension bolts generally have a square head and are turned using a drum key. A drum is tuned by turning the tension bolts. On most drum kits other than the snare drum and cymbals the only other thing you hit is toms. A 5 piece kit will typically have 3 toms – high, mid and low. For more info see ‘Parts of a Drum Kit‘. X-hats allow hi-hat cymbals to be mounted in a closed position on a cymbal stand. Commonly used instead of a drop clutch to allow hi-hats to be played ‘closed’ while your left foot is otherwise occupied (for example in a double bass drum set-up).